(from right) Tan Lin Nah, CFO, INTI; Tim Bulow, CEO, INTI; Ian Larmour, Managing Director, HTMi and Vinoth Prakas, Director of Diplomatic Relations, HTMi at the signing ceremony of the MOU. “We are pleased to collaborate with HTMi in offering these world class education pathways. Through Malaysia’s Tourism Transformation Plan, the industry aims to attract 36 million tourists and generate RM168 billion by year 2020 , indicating its high growth potential. This collaboration with HTMi enables INTI students to earn the qualifications and experiences that will help them meet the expectations of this industry,” said Timothy Bulow, CEO of INTI. In attendance at the signing ceremony was Ian Larmour, Managing Director of HTMi who shared key highlights about the established institution, including its mission of turning students into managers, and the international exposure that students gain both from the institute and the diverse Swiss community. 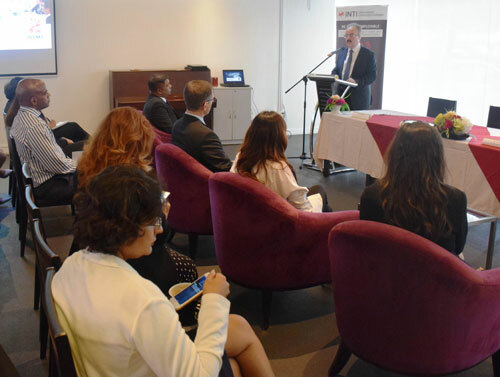 Ian Larmour, Managing Director, HTMi addresses the attendees of the MOU signing ceremony at INTI Subang’s Alkira Restaurant. Established in 1999, HTMi has five centres for excellence and offers a range of programmes including undergraduate, postgraduate and specialised courses. Located within two hotels, the campus provides students full access to actual state of the art hotel facilities where they train and interact with visitors from over 50 nations, gaining actual exposure to the day to day operations of hospitality management. Bulow explains, “Our shared mission alongside HTMi is to ensure students gain as much exposure as possible in this highly practical field of study. With most components in hospitality requiring hands on training rather than classroom study, the collaboration offers an opportunity for students to advance their experiences and training, giving them an edge in their future careers.